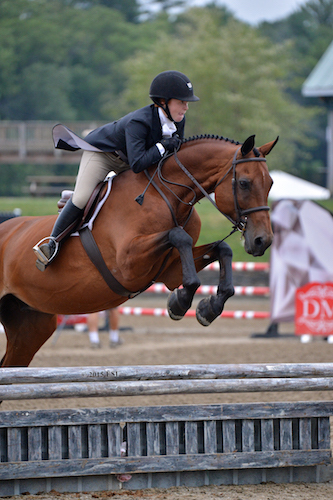 SAUGERTIES, NY (September 12, 2015): The Marshall & Sterling Insurance League National Finals returned to HITS-on-the-Hudson in Saugerties, New York Wednesday September 9 and competition was underway for the nation’s most decorated up-and-coming Children’s and Adult Hunter, Jumper and Equitation riders. Thirty-two tested the ten fence course designed by Jerry Dougherty of Bokeelia, Florida, in hopes of taking home the Marshall & Sterling 2’6” Adult Medal Final title. Owning the round one high-score of 88, Jayme Shapiro, of Irvington, New York, and Mr. Coffee, secured their place in the second round, along with the other top 11 riders. Fifth in the round two order, Veronica Tennariello, and Eur-Honor, owned by Alexandra Walsh, navigated their way to a second round score of 77, which added to their round one 78, totaled 155.5 for the lead. 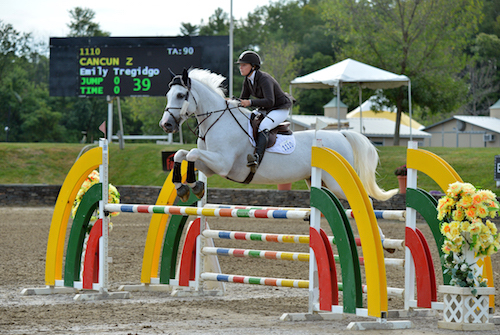 The course was trouble for the next few riders until Amy Porchetta and Robert Beck’s Temptation entered the ring ninth. They flowed through the course to add a score of 84 to the 82 they earned in round one, totaling a score of 166 for the top spot. Ninth to go was Morgan Lanza aboard Fame, owned by Paula Petrone, who cruised to a cool round two score of 84, totaling 165 when added to a round one score of 81 and resulted in a finish just behind the current leader. Shapiro and her mount closed the class with a majestic trip earning another 88 for a total of 176 and the blue ribbon resulting in a second place finish for Porchetta, third for Lanza and fourth for Tennariello. Cynthia Weber and Susan Malone’s Showin’Off was awarded fifth place. Jayme Shapiro and Mr. Coffee after their Marshall & Sterling 2’6” Adult Medal Final win. Emily Tregidgo, of New York, New York, and Cancun Z, owned by Showcase 81, LLC., bested a field of their peers with two clean rounds for the blue ribbon and the $7,500 Adult Jumper Classic win. Only four would go clear over the round one course, designed by Dougherty, and just three would return for the jump-off. First in the order, Alissa Kinsey and her own Grisset were strong over the first two fences but a refusal at the third obstacle, plus 12 time faults, for a time of 60.933 would cost them. Second to test her luck was Stacey Mahoney and Charisma Blue, owned by CJ Towers. They too struggled with the third fence and had a rail for four faults in a time of 43.727. The final entry in the jump-off, Tregidgo and her mount took their time clearing the course with a fault free time of 47.229 for the win. Rachel S. Miller and her own Wasco finished in fourth place, followed by Cathleen Driscoll and her own Forever Blue in fifth. Emily Tregidgo and Cancun Z on their way to a $7,500 Adult Jumper Classic win at the Marshall & Sterling Insurance League Finals. It was Sydnie Ziegler’s time to shine in the $7,500 Children’s Jumper Classic and aboard her own VDL Denzo she did just that, taking home first place and a $2,250 check. One of two competitors to go clear over the round one course designed by Dougherty, it was a head to head jump-off round for Ziegler and Grace Dayton riding her own Joe Louis. Ziegler was first to attempt the abbreviated course. Carefully and thoughtfully, she and her mount left the course intact and crossed the timers in a time of 48.120. Going second in the jump-off round it was Dayton’s chance to steal the show. Zooming over the fences and staying cool under pressure, Dayton had it in the bag until she had a single down rail at the final fence resulting in four faults and a time of 46.006 for second. Third place was awarded to Joan Reilly and her own Condor. Jessica Deatlenza rode her own Zebrano to fourth place, with Alex Collins and Amir Wagner’s Clautina finishing in fifth place. Sydnie Ziegler won the $7,500 Children’s Jumper Classic at the Marshall & Sterling Insurance League Finals aboard VDL Denzo. 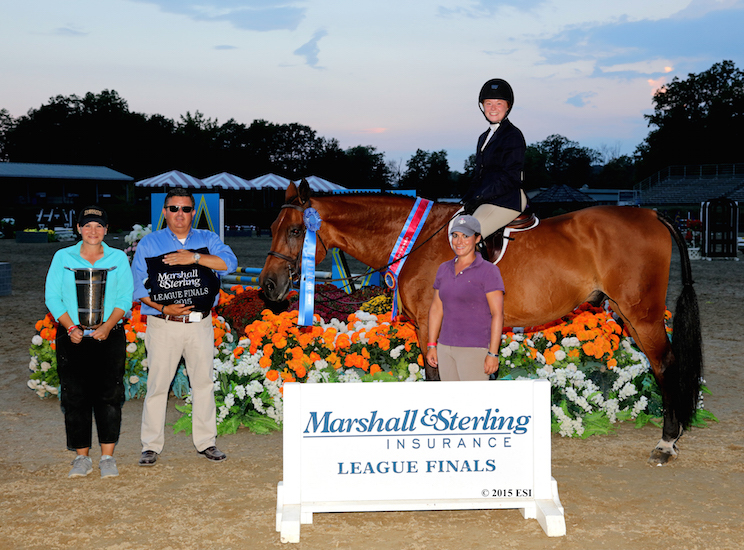 Day two of the Marshall & Sterling Insurance League National Finals was another good day for Jayme Shapiro, of Irvington, New York, and Donald Stewart’s Mr. Coffee, who had won the Marshall & Sterling 2’6” Adult Medal Final the day prior. Besting a sizeable class of 67 competitors from across the East Coast, they steered their way to a $1,500 Bit O’ Straw Hunter Classic win with double 88 scores for a total of 176. Round one competition was challenging and those who found themselves in the top 12 to move on to round two, earned it with preliminary scores all in the 80s. Competition in the second round began to heat up when the seventh entry, Karli Hanson and her own Sail On received a score of 85, which added to their first round 83.5 totaled 168.5 for the lead. Each rider to follow Hanson hoped to one-up her to take the lead. Tenth to enter the ring, That’s What Girls Like piloted by her owner Colleen Soulias came close when she finished with a score of 81, totaling 168 when added to their round one score of 87, to finish just half a point behind Hanson. Shapiro was the final entry of the day and saved the best for last. Coming in with an 88, the high score of the day, she cruised up the leaderboard with another 88 to take first, bumping Hanson to second and Soulias to third. "Jayme just graduated from college, so she's only been back riding with us for the past few months, but her hard work and dedication really paid off," said Shapiro's trainer, Sarah Friedman. "Scoring not one but four 88's in a row is just fantastic. This couldn't happen to a nicer, more deserving young lady and Coffee is just the most special horse." "Kudos to Tom and HITS for giving all of our riders the opportunity to show at these finals. Everyone works hard to qualify and it feels important, so everyone hopes to be successful," continued Friedman. "It's so nice that they offer something for every level and we look forward to setting the goal of qualifying for Marshall & Sterling Finals every year." Fourth place was awarded to Devin Bokert and her own Two By Two. 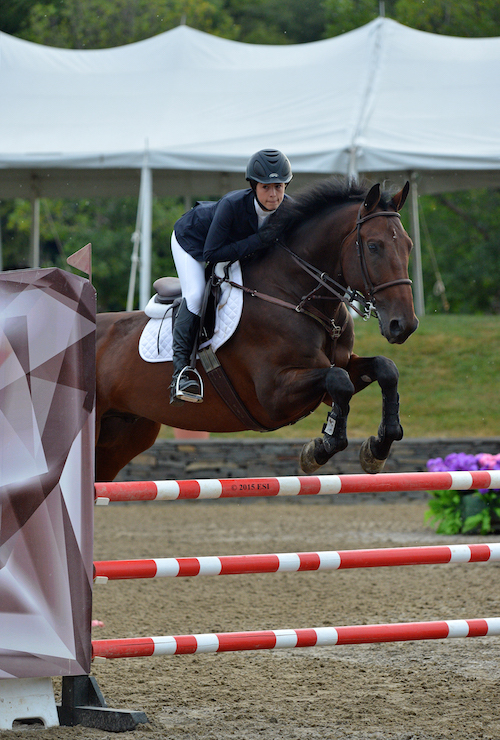 Clara Louvet and Stay Gold, owned by Patrice Gordon rounded out the top five. Jayme Shapiro and Mr. Coffee on their way to a $1,500 Bit O' Staw win at the Marshall & Sterling Insurance League Finals. Melissa Feller and So What, owned by Arklys, LLC., were the HITS Working Hunter 2’6” Professional Champions, having received blue ribbons in both Over Fences classes and second in the Under Saddle. Fellers also earned the Reserve title on her second entry, Lazio, owned by Redfield Farm. They placed second in both over fences and fourth in the Under Saddle. Dawn Von Bernuth’s Uptown Girl piloted by Elspeth Roake was the HITS working Hunter 2’6” Non-Professional Champion, having placed third and first Over Fences and first in the Under Saddle. Reserve Champion Was Meagan McCusker and Clover, owned by Brook Chasin. They were fifth and second Over Fences and second in the Under Saddle. The HITS Working Hunter 2’Champion was Annika Srivastava and Patriot, owned by Leslie Kogos. They were second Over Fences and third in the Under Saddle. Reserve Champion was awarded to Ava Nolletti and Autumn Farms’ Woodland’s Berry Hazy who received a first and sixth Over Fences and sixth place in the Under Saddle. Melissa Feller and Holiday Best, owned by Nancy Bloom, were crowned the Adequan Working Hunter Champions after placing first and second Over Fences and first in the Under Saddle. Brian Feigus and Rock Harbour, owned by Alexa DeRosa, received the Reserve ribbon after placing second and first Over Fences and third in the Under Saddle. The Adult Working Hunter Champion was Regina Barasch and her own Incognito, with first and second place finishes Over Fences. Reserve honors went to Madison Strony and her own Aye Spy who took home the blue ribbon in the Adult Working Hunter Stake and fourth in the Under Saddle.